If you have a teen, especially an older teen, you may be starting to worry about life skills that you MUST teach your teen! You have taught them many things since the day they were born but now the crunch is on! Soon they will be moving out and how in the world do we teach them the life skills to be prepared for that? Kind of scary when you think about it. Isn’t it? 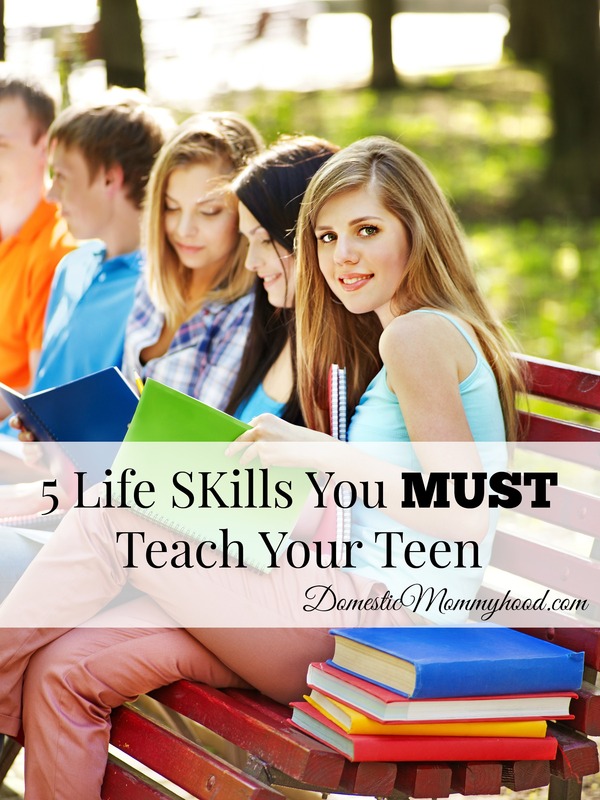 Here are a few Life Skills You MUST Teach Your Teen to get you started……. Having a Bank Account – It is very important that your child knows the ins and outs of having a checking and savings account. We started early in our house using Discovery Toys Bankit System. It is for children 8 years and up and is a very good resource to use when starting early with the skills to balance a checking account. Otherwise, if you have slacked in the department of teaching them early like most parents then take them up to the bank and open an account. Watch them closely and work slowly on teaching them the ins and outs. Paying Bills – They need to understand everything about a bill and the importance of paying it on time. Show them a few different bills that you have. Let them see for themselves how much a cell phone can cost or how much an electric bill can fluctuate. Making Appointments – This can be absolutely terrifying if you have a shy child. I can honestly tell you that it took me until the age of 25 to feel comfortable making appointments. I actually put my health on the back burner many times because I was “afraid to call”. Have them make their own appointments for the last 2 years they are at home. You can stand by and monitor the call and offer support to them. Laundry – I’m not gonna lie….. I hate anyone touching my laundry. My husband for some reason gets quite offended by this. Really?? I would think any man would be in heaven not having to do laundry! On a serious note, you child really needs to know how to do laundry. Pick a Saturday and teach them. We found it beneficial to make a chart and stick it on the wall. That way when I ask her to do it again I don’t have to follow her down…… although secretly I’m watching like a hawk! If You Mix Cleaners YOU MAY DIE!! – This is probably the most important life skill you must teach your teen!! Here is what happens when a teen moves out….. the don’t clean. Then their toilet is disgusting…. then they pour in some ammonia ….. it’s still disgusting so they had some bleach!!!! Tell them never mix chemicals. Bad reactions happen and people die…… or maybe they just lose a lung. Either way…. it’s bad. That is the top life skills you must teach your teen that came to me today. Make sure that you subscribe to my email updates because I am going to be adding tons of these life skills and I don’t want you to miss out on them!